It’s always really informative to see what’s washing up on the beach at high tide. 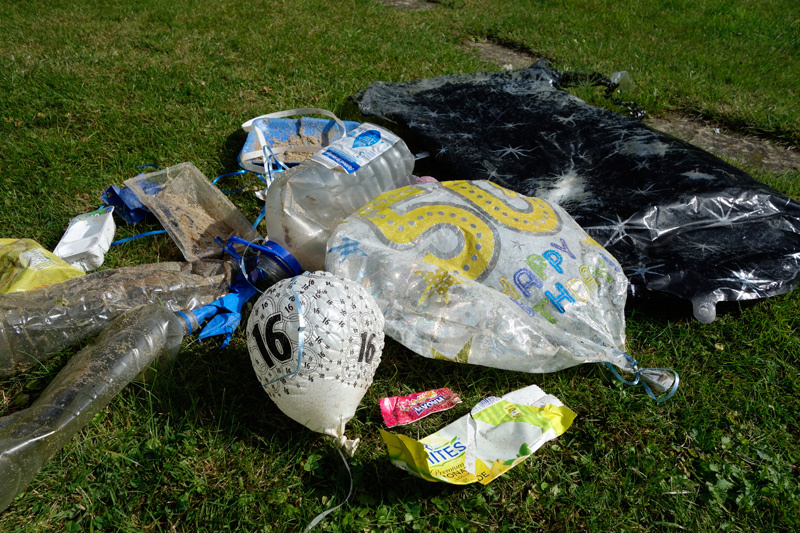 Today’s haul included another 4 balloons (including the large black “bag” on the right in the photo). 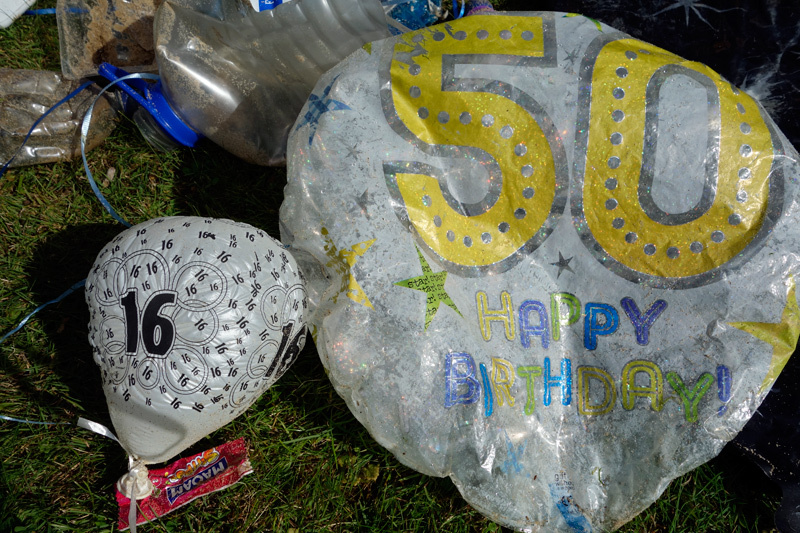 Notice the two birthday balloons, 16th and 50th birthday celebrations enjoyed somewhere nearby, but how nearby I wonder? All of these balloons have floated in on the high tide or have floated aloft on the breeze before loosing altitude and landing on the water. I’m sure none of the people involved in these celebrations would have any idea that their party consumables have ended up on the beach, which just highlights that, even if we are careful about disposing of our single use plastic items, we can never be 100% sure that they will make it to a landfill or recycling centre, and won’t instead end up on the beach. And because we can’t be 100% certain, perhaps we shouldn’t be too quick to point fingers at the “invisible” culprits. Let’s instead put that energy into just bending down and picking it up. At least then we have done something positive about a very negative situation. The main purpose behind Just-Pick-It-Up is to encourage and support making the practice of picking up plastic a habit that we just do for the sake of it. Organised cleanups are brilliant for mobilising people and focusing on a particular area and “blitzing” the plastic there but I believe we can make even more of an impact if we make picking it up a normal part of our daily lives. We can make a huge difference every time we pick something up. The more people who do it the bigger the impact. Another really important aspect of this is the positive sense of achievement we get when we realise we have potentially saved a life overtime we remove a piece of plastic from the environment. I certainly find that It really does feel good to do something positive and helps me feel less helpless and overwhelmed by the enormity of the problem. After all, we really won’t fix this problem by just talking about it. Of course we need to change the way we use plastic (40% of plastic produced each year is used for single use packaging), we need to stop more plastic getting into the environment but we also need to remove what’s there. The only way to do that is to pick it up. Noticing the types of plastic that we pick up can also inform us about the consumption behaviours that are contributing the most to the plastic pollution problem and can help us change our own patterns of consumption. So, all in all, Just Picking It Up is a win win situation. You feel good about doing something, you are saving lives and your working towards changing consumption habits. And if you think it’s all too little too late then I encourage you to do a little arithmetic. For example, in the last three days, while enjoying my run on the beach, I have removed approximately 40 pieces of plastic from the beach. If 10 other people did the same 400 pieces would be removed. If 100 people did that, 4000 removed and so on. Just imagine if a million people just picked up a few pieces of plastic while enjoying the beach. Well, you may not see them all doing it but you aren’t alone, you are part of a growing army of plastic warriors. And every time we learn more about our own habits and can change them. Sometimes I still get angry when I see plastic on the beach or stuck in hedgerows or lying on the side of the road, but instead of just letting that anger add to a sense of helplessness and despair I pick it up and concentrate on the positive effects my actions will have. Let’s share the positive vibe and encourage our friends to just pick it up. let’s not get stuck in the blame game and let’s just focus on removing this stuff from our beautiful home. And if you’ve read this far then you are obviously already a plastic warrior and I salute you.